There are times when you want to drill through timber and to predict exactly where the drill will exit. This is very difficult if the timber is not rectangular and the hole is not to be perpendicular to the entry face. I have yet to find a proprietary tool for this job. This drill guide was made to facilitate drilling new frame members of a 1931 Riley Monaco . The frame is constructed on Weymann body principles – i.e. the frame members are connected together with ¼” Whitworth screws through the timber and predrilled 1/8” thick steel plates each side. The guide ensures that the hole drilled for each screw will always connect through to the predetermined position of each plate. The guide was made from a large ‘U' bolt cut to size, with 5/8” mild steel bar welded to the ‘U' bolt ends, and a length of 3/8” Whitworth studding to provide the clamping and back location function. 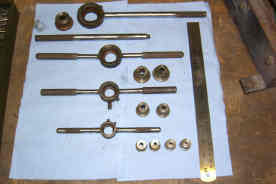 Two short lengths of bar were drilled and shaped on a lathe, with one having a plain ¼” hole and the other drilled and tapped to 3/8” Whitworth. 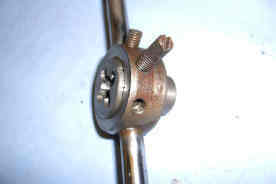 The studding was turned on the lathe to 1/4” BSF over about 1 ¼” using the tapped bar as a ‘chuck'. The studding was then used to support the two pieces of bar and provide precise alignment while they were welded to the ‘U' bolt. A short length of ½” bar, to form the back locating point was also shaped in the lathe - drilled and tapped to ¼” BSF to fit the studding and partly opened out to 1/4" to allow the 1/4" drill to pass fully through the timber. Finally a slot was formed in the end of the studding for screwing in and out. This tool has proved completely effective and easy to use. More sophisticated versions could easily be made by using larger diameter bar drilled to accept inserts with different internal diameters. Taking the Tantrums Out of Thread Cutting. There are many occasions in the workshop when it is useful to be able to cut a thread on stock bar, for example when a new stud is required. It can be slow and sometimes difficult to start the die off so as to avoid cutting at an angle, particularly on small diameter pieces. Not a problem when cutting the thread on a lathe (using the tailstock to keep the dieholder square) but that luxury is not always possible. Many years ago I decided to make life easier when it came to cutting such threads with hand dies. Having seen plumbers using die cutters with guides for large diameter pipe threads, I decided this principle could be applied to small diameters as well. There may well be proprietary tools available, but at the time I could not find any; over thirty years later I have still not come across any. Nevertheless, I do not claim any design novelty and no doubt there is something out there. So I got to work on the lathe and made modified die holders deep enough to take interchangeable guides as well as the die. A modified dieholder is required for each standard (overall) diameter of die; for each of those dieholders a guide is required for every size of die used by the dieholder – obviously! In fact the number required to serve all imperial sizes commonly used is modest, i.e. 1/8” through to ½” in 1/16” steps; there is very little duplication of thread diameters among the dieholder sizes. When drilling the guide to the size required it is worth selecting the drill 1/64” larger than the nominal thread diameter, to allow easy running. Similarly the overall diameters of the guide flange and main body should be slightly less than internal diameters of the holder. Dimensions are determined from the normal dieholder and die. The depth of the die can be varied, but should be at least the diameter to be cut. The guide is undercut adjacent to the flange to provide good seating. I made both dieholders and guides in mild steel, and they have lasted well with no sign of wear. The result is that diecutting threads is considerably simplified and predictable, and virtually a one handed operation. There are limits where the length of bar available is shorter than the die + guide, but as long as the job can be started the die can be reversed in the holder (to maintain the lead-in) and the thread cutting continued with the guide ‘on top' out of the way. The pictures show the whole range of dieholders and guides I have ever used, and a partly assembled tool with die. The range of modified die holders and guides for common sizes up to ½"